Confronting a nation’s history involves confronting its national myths. If the country is our own, that can move us right out of our comfort zone. As we in Scotland get closer to the referendum on independence, the issue of our history seems to take on more importance, and we are reminded of George Orwell’s words, from ‘1984’, “He who controls the past controls the future. He who controls the present controls the past.” Looking at the past, for the purposes of this debate, were historian-authors Michael Fry and Angus Konstam. Their chairman Joseph Farrell described them as ‘heavyweights,’ and although Angus Konstam suggested that if the conversation flagged the two of them might entertain us with a bout of sumo, the chairman was clearly referring to their intellects. To Michael Fry, control of the past, as in the publication of books on Scottish history, has been left too long in academic hands, and has been a one-sided account of social and economic history replete with statistics. His bias was towards culture, society, and politics, in the search for what has kept Scotland Scotland; he has found that when a historian undertakes research he finds things which relate, albeit perhaps as echoes, to today, and that what we recognise are not the products of sudden upheaval but have deep roots. 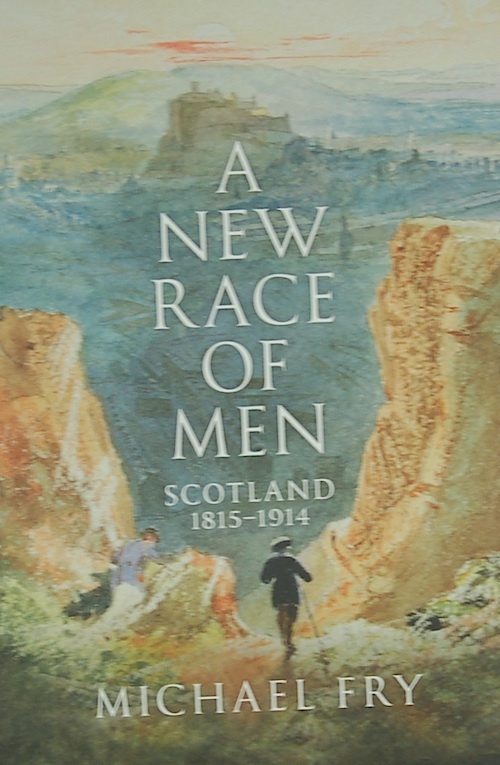 In his book ‘A New Race of Men’ – the title being a phrase taken from observations made in 1845 by the Rev. George Cruden, one of the few kirk ministers to have taken part in the Statistical Accounts of Scotland in both 1794 and 1845 – Fry presents a picture of a nineteenth-century largely at peace, with a conservative constitution (if I can use such a word) that supported that of England, union with the rest of the United Kingdom long since a ‘done deal’. Scottish capitalism was in the hands of men who had served their time as apprentices and shared social roots with the men who worked for them, giving rise to a sense of egalitarianism. In movements such as public health, it was recognised that contagion did not stop at the edge of working-class areas, and that therefore health belonged to all, not simply to the bourgeoisie. Ideas like this didn’t fail to draw dissent from the floor. 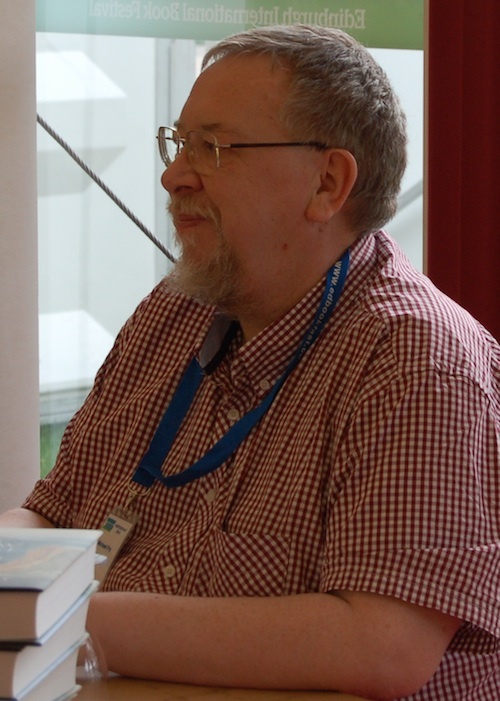 A questioner from North East England challenged the assumption that the nineteenth-century Scottish working class was any less exploited than the working class in his own area – and indeed the supposed difference that Michael Fry had suggested between the Scottish and English concepts of class did seem to sit rather awkwardly with a previous statement to the effect that the North East of England, for example, shared much of Scotland’s perceived remoteness from London and Westminster. Another questioner challenged the idea of the ‘done deal’ with its roots going back to the eighteenth century, citing the verse in ‘God Save the King’ about ‘rebellious Scots’; unfortunately her point merely perpetuated the canard that the verse is insulting to the Scots as a whole, when it is actually specifically directed at the Jacobites. Fry made this point in reply, however – that in the ‘age of revolution’, between 1789 and 1848, while the death toll in political causes in other countries was high, there was a total of twenty-three in Scotland. “I counted them’” he said. Angus Konstam, although principally a maritime historian, has been fascinated by Robert Bruce since reading a ‘Ladybird’ book about him. In his book ‘Bannockburn’, according to the event pre-publicity, Konstam ‘debunks some myths about the legend of Robert the Bruce’. He describes the modern popularity of Bruce as ‘a national talisman… wrapped up in romantic guff’. The definition of Bruce’s wars as ‘Wars of Scottish Independence’ was a later one, as are those of a nationalist or a class war, both of which would have been lost on Bruce himself. The thirteenth- and fourteenth-century conflicts were fought to ‘solve purely medieval problems’, and in them even Bruce himself changed sides more than once. 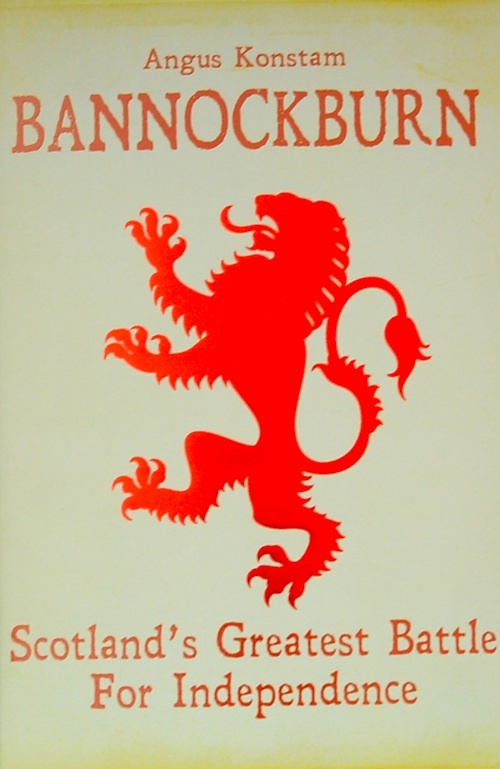 Nevertheless, by the time of Bannockburn there was an unprecedented and unfamiliar wave of specifically Scottish patriotism that must have lent something to the subsequent sense of Scottish identity. For all that, the presentation did leave me wondering what myths were going to be debunked. It is more than forty years since Nigel Tranter’s ‘Bruce Trilogy’ was published, moving into popular fiction what historical study had long made known – Bruce’s career as a serial turncoat, and his murder of a rival. I listened to the account of Clifford’s unsuccessful charge against the Scottish infantry, and muttered to myself that surely the knowledge that horses will pull up before a solid mass of footsoldiers was known as far back as the Greek phalanx. However, we were brought back to popular myth when Konstam reminded us of the legend of Bruce and the spider – “It’s in the Ladybird book, so it must be true,” he said with a smile – for which there is no evidence beyond its existence in popular folklore. Of the two books foregrounded, it strikes me that Michael Fry’s is probably the more controversial. 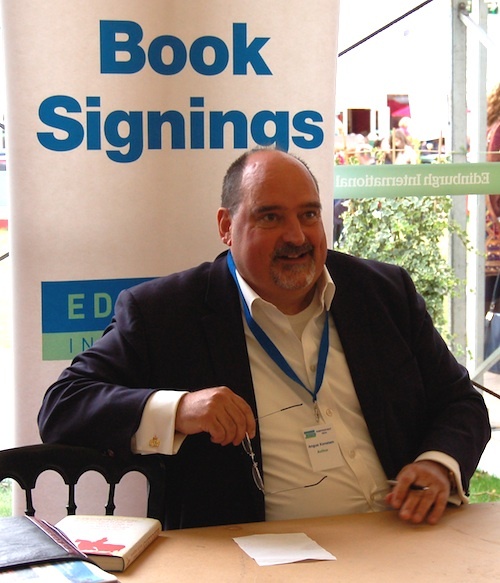 However both authors were kept busy signing copies of their books after the event. I have to say I was left wanting more time for public discussion with the two authors – to drill down into some apparent contradictions in what Michael Fry said, to challenge Angus Konstam further about whether the myths about Bruce were actually as powerful as he assumed. Joe Farrell did make the point that the pair seemed to have been drawn together simply because they were historians. 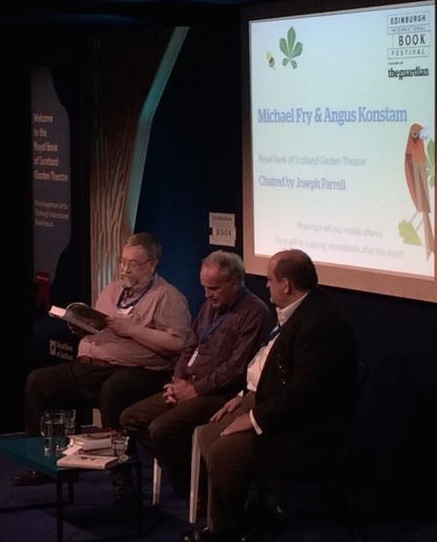 This was the first time I had attended an event at the Book Festival when I wondered if either of the authors on stage was thinking to himself “If I were Germaine Greer or George R R Martin I would have this stage to myself. 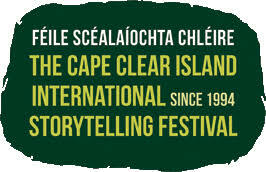 Obviously I’m considered second division!” I am happy to give the Edinburgh International Book festival the benefit of the doubt on this issue, because it does what it must to pack so much into its schedule, and by-and-large gets it just right.